Have you ever used tahini in a cookie recipe? 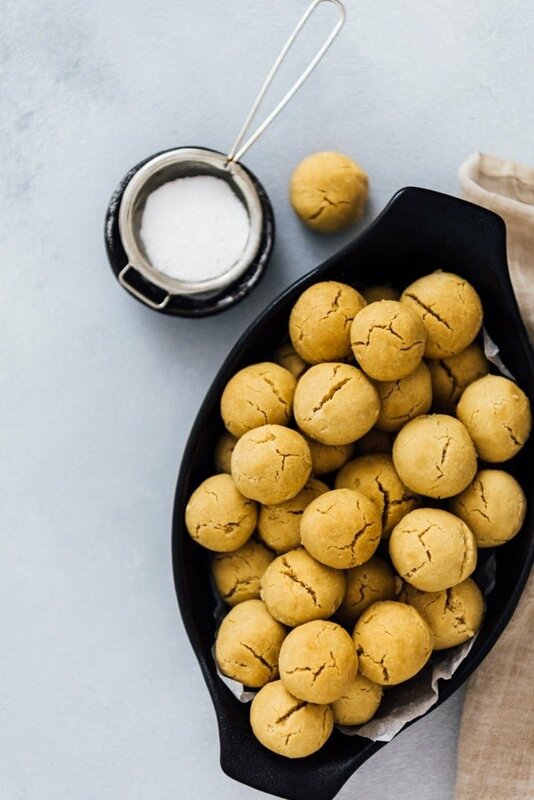 This Vegan Tahini Cookies Recipe is a perfect chance for you to try it. No butter, no eggs and the cookies come together really fast with only 4 ingredients. They are melting in your mouth and you will be amazed with the nutty flavor coming from tahini paste. I made these tahini cookies a while ago and took some to the school to share with some colleagues. A student of mine knocked the door just as I was serving these to a few friends. You know what? All friends got their shares and my student was lucky enough to get the last one left in the box. She didn’t open her eyes until she finished her bite and she immediately asked for the recipe. She was so surprised when she learnt how easy it was. After a week, she came to my room with a small box full of tahini cookies. It was my turn this time to get surprised as her cookies were super yummy as well. Tahini in Savory or Sweet Recipes? 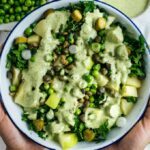 Although tahini is mostly identified with classic hummus or vegan tahini dressing recipes, it is a wonderful twist when used in dessert recipes too. While making cookies with tahini is quite usual in Turkish cuisine, I know it sounds weird to most of you. 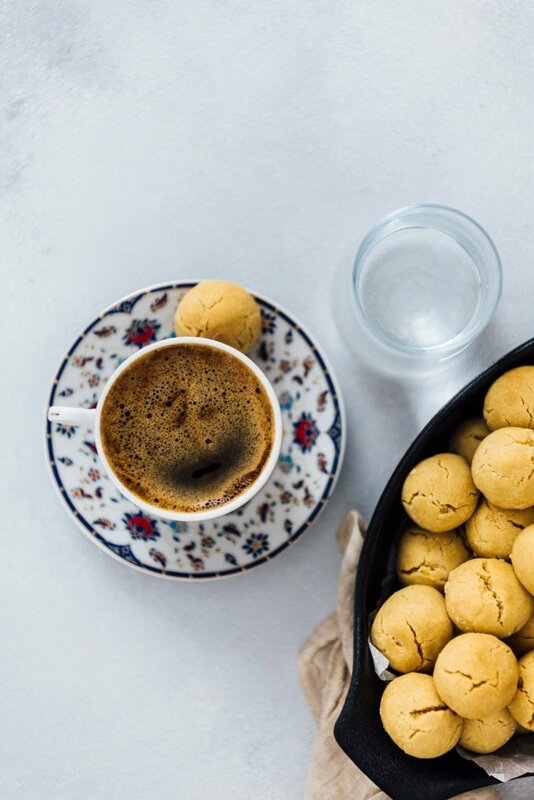 If you are familiar with Melting Moments Cookies and love them, tahini cookies will become one of your favorites too because they are equally soft and melting in your mouth. Unlike melting moments cookies recipe, this one doesn’t call for butter. It is substituted by a combination of olive oil and tahini. Furthermore, these cookies interestingly taste like your perfect peanut butter cookies. So if you are a fan of them, what are you still waiting for? Give this recipe a try asap! These cookies are completely vegan because the cookie dough has neither eggs or butter. Did I tell you that we only need 4 ingredients? This is a stupid easy cookie recipe, so you have no excuse not to try it. All you need to do is to combine all the ingredients and shape them into balls. You can measure dough using a tablespoon so that all the balls are at the same size. Then bake until slightly golden. The important tip you need to know here is that you should let them cool completely in the baking sheet. They are too soft and if you try to grab one before they cool, it will crumble. I love these tahini cookies as they are. Not overly sweet and with a nice color. Are you one of those who love their cookies really sweet? Taste one and if you think they need a bit more sweetness, dust them with powdered sugar. This step is completely optional. Although I love the simplicity of this recipe, I sometimes add one more ingredient to the dough: walnuts. 1/2 cup of crumbled or ground walnuts go really well with other ingredients. While walnuts are wonderful, you can get creative about this one additional ingredient. Finely chopped pistachios, almonds, pine nuts or even dried fruit would be great too. Can I Freeze These Butterless Cookies? 1) divide the dough into two and put one half in the freezer. Let it thaw on the counter when you are ready to bake, roll it into balls and then bake. 2) Shape the whole dough into balls. Bake one batch and place the rest of the raw cookie balls on a tray and freeze for about 30 minutes. Then transfer them into a freezer bag and store in the freezer. Let them thaw and then bake whenever you crave for something sweet and nutty. Keep them in an airtight container and enjoy up to 5 days. If you love to have something sweet with your coffee, having a box full of these melting-in-your-mouth cookies on the counter is priceless. Oh and if you know How To Make Turkish Coffee, go make some and spoil yourself with a cup of coffee and one or two (or more!) tahini cookies on the side. Tahini cookies with 4 ingredients. No eggs, no butter. These are melting in your mouth! Preheat the oven at 350F (180C). Combine all ingredients and make a soft dough. Roll it into mini balls and place them on the baking sheet. Bake them until they get slightly golden about 20 minutes. Don’t try to transfer them on a cooling rack before they cool completely as they are too soft to hold. This post was originally published in 2011 and has been updated with new pictures and additional information. I don’t have castor sugar, do you think regular white sugar would work for this recipe? Also, any idea on how to prevent the cookies from falling apart as the previous poster commented on? I am just being cautious before I try the recipe because I hate wasting food! Sabiha, I think white sugar works fine too for this recipe. Well, these ingredients hold together for me, but if your dough doesn’t hold together, then maybe you can add a little more flour and little butter. Hope you have a good result! into the dough just for a nice look. They held together pretty well. I think next time I’ll also add some ground pistachios and less tahini, what do you think? Happy to hear that the result pleased you! Dusting with icing sugar is a good way to arrange its sweetness. And I’m sure your cookies look fascinating with sesame seeds and topped with icing sugar. Pistachio sounds like a great idea! I think it gives a nice flavor and texture. These are yummy, but unfortunately, when I made them, did not hold together at all! They crumbled coming off the baking sheet and most just barely made it into the box. Many just turned to crumbs on the way. It was more of a “streusel” and less a “cookie.” But they are tasty- I topped ice cream with the remains and it was delicious. Tahinle yapıldıysa tadından yenmez bu kurabiyeler:) çok hoşuma gitti, sevgiler. Hi Zerrin, these cookies look amazing, I love the cracks on top. Cute story, Zerrin! The cookies look really delicious!